Our May meeting will take place at 11:00 a.m. on May 19th. The location and program are tbd. Check back here for more information. Or contact Amy Ziegler if you are able to host. Be sure to visit us in Aisle 23, Pavillion 2, meet our Morgans, and sign up for a complimentary membership! The Wisconsin Morgan Horse Club has proudly represented the Morgan breed at the Midwest Horse Fair for many years. 10 talented Morgans and their human partners will demonstrate Morgan beauty, versatility, and color during the breed demos, liberty, and dressage free style competition. . All the details on our club, Morgan history, and this year’s participants are in this month’s newsletter which will download as a pdf. Our stalls and hospitality booth are located in AISLE 23, Pavillion 2, just across from the Brand Arena. It is worth a stop as our booth will be manned with volunteers eager to share information and the club is offering a complimentary, one-time membership for the remainder of 2019 if you sign up at Horse Fair. Be sure to also check out our beautiful Morgan stallions on Stallion Avenue, Edgefield Trail Blazer, Royal Gold Ariston (who will also participate in the breed demo), and Toroy Golden McClintock. Here is a handy list of key Morgan events throughout the weekend. Wingait Farm will be putting on a Youth Safety Clinic on Saturday March 30th at 1 p.m. Please contact Anita Fanscali, 608-795-2914 or 608-963-2828, for more information. 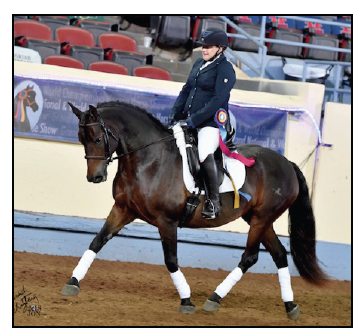 Sarah Kygeris of Double SS Pleasure Morgans and Doug irvine will hold a Show Ring Ready Mock Show and Safety Clinic on March 23rd at Dala Stables in Oshkosh. Topics will include showing etiquette demonstration focussing on knowing your surroundings and how to handle different situations in the ring for safety purposes. The mock show will have four classes , Walk Trot Saddleseat, Walk Trot Hunter and Western and Walk Trot Canter Saddleseat and Walk Trot Canter Hunter and Western. The clinic will end in the heated workshop with lunch and a discussion on show preparation. Participants are all registered but observers are welcome. Contact Sarah or 920-216-6906 for directions and more info. March Meeting, Sunday, March 17th at Jim and Pat Ziegler's, 11:00 a.m.
Club Meeting at Jim and Pat Ziegler’s B-Hawk’s Morgan, 7061 Taylor Rd, Sauk City, WI — potluck lunch. Please bring a dish to pass. Pat will supply utensils, plates, coffee and pulled pork sandwiches. The meeting will be in the house but club members will also look over our inventory of items and assets make some decisions about what to keep and where to store. The items are in the arena so dress accordingly. Directions: Take County Trunk Y to the west, which is two miles south of Sauk City on Highway 12. Then are Taylor Road to the south. Number is 7061 Taylor Road. The February meeting will take place on Sunday, February 17, 2019 at Maxim’s at Oconomowoc Depot, 115 E. Collins St. Oconomowoc, WI, (262) 5690-0072. NOTE: The Board will hold a budget meeting at 10:00 a.m. The regular meeting will start in the bar at 11:00 a.m. and we will order off the menu. Join us for a belated holiday lunch at the Moosejaw Restaurant on Sunday, January 20, 2016. Lunch will begin promptly at 11:00 a.m. with meeting to follow. Please bring a non-perishable food item for the Food Pantry. There will be games and a drawing for prizes, including a one year membership to the AMHA. Please RSVP to Judy Tate at tomandjudyt8@charter.net or (608) 524-3938. It is important that the restaurant have a good head count by the 17th. Directions: Take Interstate 90/94 to Exit 89/Wis Highway 23 in the Dells. Turn EAST onto Highway 23 and continue for 0.8 miles. The restaurant is on the right. The October meeting will be held on Sunday, October 21st at 1 p.m. at Jeff and Anita Fanscali’s Wingait Farm 5764 Morrill Road, Mazomanie, WI. Catch up on summer activities, get reports from OKC, and see Jeff and Anita’s fine Morgans. Snacks and beverages will be provided. Food will be served at picnic tables in the garage so dress warmly. Please RSVP to Chrissy Kirch at chrissy.kirch79@hotmail.com or (608) 606-5807. FYI, for planning purposes, the November meeting will be on the 18th, the weekend before Thanksgiving at Benvenuto’s in Fitchburg, WI. Time and agenda to follow. The Morgan World Championships kick off on Saturday, October 6th in Oklahoma City. The AMHA is again making it possible to follow the events on live stream. All four arenas— Coliseum, Performance and Sport Horse 1 and 2 are available for streaming. A complete class by day and arena is here. Tip: To find a particular horse or participant, search by name on the gatekeeper page for the name and note the class numbers. You can find the class numbers on the class list for time and arena. Jericho Creek's All Breeds Open Show is coming up this weekend at Walworth County Fairgrounds in Elkhart, WI. Follow this link for show information. A portion of the proceeds will benefit Horse Power Healing Center. A great cause and great weather predicted! 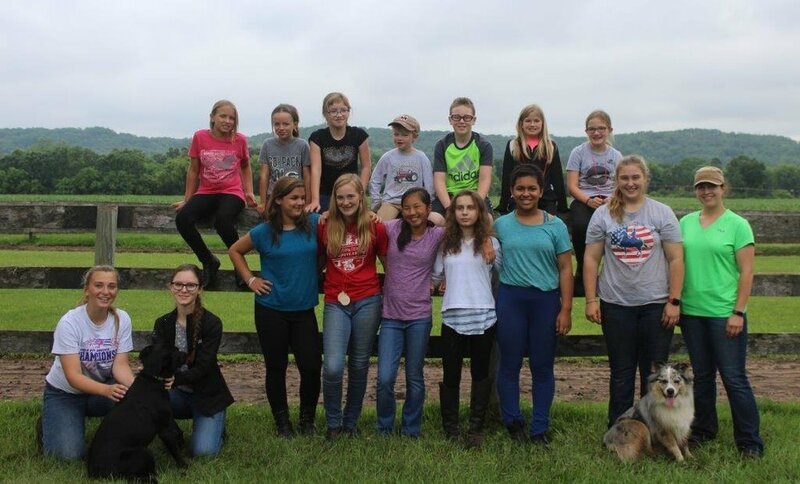 Great opportunity to get input from horse professionals on topics such as evaluating movement, getting ready for shows and summer events, safety on the ground, saddle, and show ring, with mock classes in English and Western. Space is available for 10 horses and riders and unlimited number of auditors. Please contact Katz Jackson or Amy Ziegler to register. If you are interested in participating, whether on horseback or as a volunteer/sidewalker/flag bearer, please contact Darcy at (608) 434-3595, or speak with her at our next meeting on May 20th. We are also actively seeking sponsors for our unit. Your company name and logo will be carried on a banner at the head of the unit. These parades have huge crowds and this sponsorship is one of your best value for dollar marketing investments available. The club is busily preparing performances, public facing activities and logistics for the Midwest Horse Fair. This year's theme is 40 Years of Legends, and the WMHC will celebrate with our Morgan legends. Amy Ziegler is recruiting volunteers for set-up day, April 11th. Please contact Amy. amysziegler@gmail.com, (608) 643-3030 if you can assist and check out the Horse Fair page for participants' bios and other info coming soon. National Day of the Morgan-October 28, 2017-Open Barns. Meet a Morgan! The AMHA is inviting all members to host open barns on October 28, 2017, the National Day of the Morgan. Participating barns are being promoted on the AMHA website, and the AMHA will provide literature and ideas for activities. November 4, 2017 is an alternate day for the open barn if the 28th is a conflict. You can fill out an application to be listed as a participating barn with this form. The WMHC board is holding an open board meeting on August 19th at 11 am in Portage, WI. It will be open to all members. Here is your second chance this weekend to learn the history of and witness the versatility, beauty, and willingness of our wonderful breed in the Morgan Breed Demo at 4:40 p.m. in the Coliseum. Each of our participants is featured in our April newsletter, but better yet, step into Pavillion Two after the demo and meet them in person. We are in stalls 1516-24 and 1616-24, near the Coliseum end of Pavillion Two, right across from the arena. Isabelle Abderholden and Indian Summer Silhouette. Meet them at the Midwest Horse Fair. Friday, April 21, 2017: Morgan Breed Demo 3:40 p.m.
Come and meet our marvelous Morgans in our breed demo at 3:40 p.m. in the HW Brand Arena, Pavillion Two, and then step across the aisle to stalls 1516-1524 and 1616-1624 and meet our participants in person. Each of our participants, human and equine, is featured in our April newsletter. We hope to see you there! Sarah Gay and the beautiful and unusual gray Morgan, Georgia, are headed to the Midwest Horse Fair. he Wisconsin Morgan Horse Club parade unit will step off at noon on Sunday, September 18, 2016, in the Wisconsin Dells' Wo Zha Wa Parade. The Wo-Zha-Wa Festival is a three day end of summer/start of fall celebration from September 16-18, 2016, that includes an arts and crafts fair, antique flea market, Maxwell Street days, road race/fun run, carnival rides and a 100+ unit parade on Sunday. The club can use volunteers to side walk and carry banners. Please contact Darcy Overturf, (608) 986 3362 if you can help. 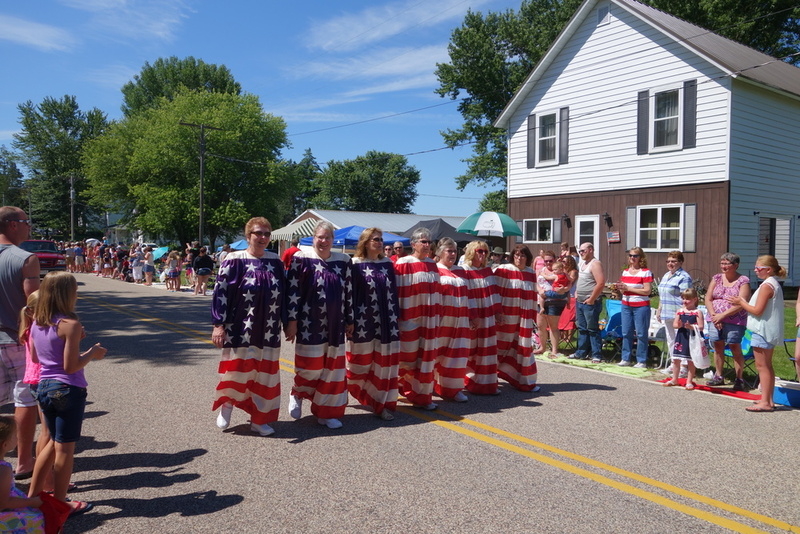 The Wisconsin Morgan Horse Club continues its summer parade schedule with the Cow Chips Festival Parade in Sauk-Prairie on Saturday, September, 3, 2016, at noon. Contact Darcy Overturf for information on staging location and riders-up time, (609) 986-3362. The Morgan Masterpiece Charity Horse Show will be held at Sunnyview Exposition Center in Oshkosh, WI, July 14-16, 2016. Deadline for advertising in the program book is July 1st. A copy of the sponsorship form is available here. The prize list and entry information will be available soon at the Masterpiece website. For questions and information, contact Anita Fanscali at (608) 963-2828 or wingait@centurytel.net. 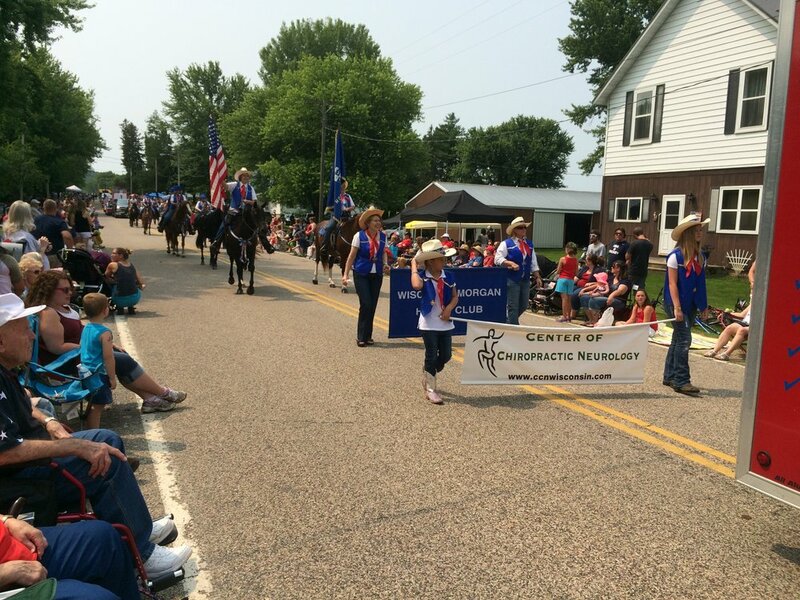 Fourth of July Parade, Witwen, WI, 10 a.m.
Classifieds: March 26th Deadline for Horse Fair Newsletter-Update Now! Classified advertising is a benefit of club membership. Members who are paid up receive two free text ads per year, which run in the newsletter for a calendar year and on the website for one year from placement. A photo ad on the website has an additional $5 charge. Additional website photos are $2 each. Contact Mary Ellen Grayor Heidi Harvey for more info. Take advantage of your free listings now because March 26th is the deadline to submit ads to Mary Ellen Gray for the newsletter issue that will be posted and distributed at Horse Fair. Also, March is the highest traffic month of the year for classified ads on our web site. If a listed horse or item has sold, please let us know so we can note that and keep the listings current. No horses to sell? What about all those saddles that no longer fit any horse you own? Listings can be in categories such as stallions at stud, horses, tack, equipment and horsey items for sale, as well as services such as training, boarding, hauling, shoeing, etc. Enjoy "A Winter Day in the Park" at the annual sleigh rally at Fireman's Park in Columbus, WI. The event includes a silent auction, bobsled rides, food, music, and a model horse show (entries due 2/9/2016). 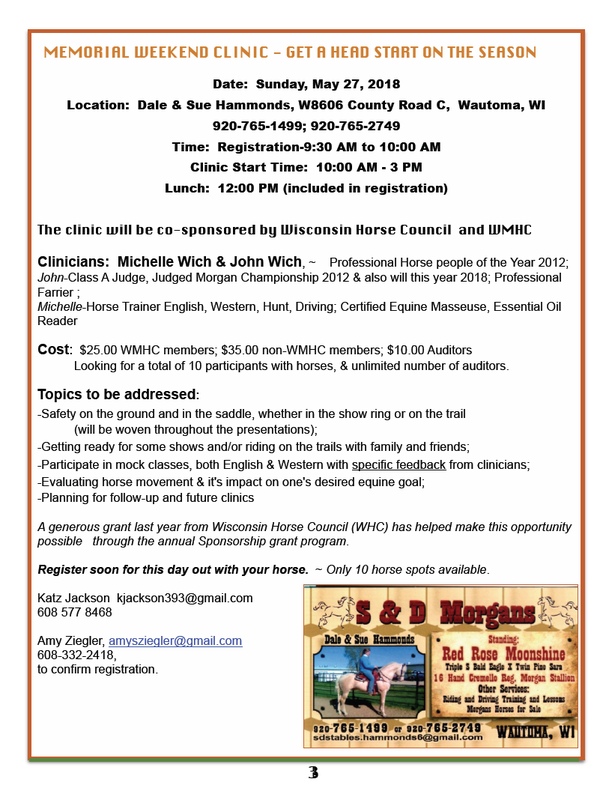 The event benefits the Wisconsin Equine Foundation of the Wisconsin Horse Council. Our wonderful breed will be well represented by Gary and Katz Jackson. Gary is the current president of the Wisconsin Equine Foundation. The Wisconsin Morgan Horse Club recreates the horse-powered era of the late 1880s to early 1910s at the popular Morgan Field Day on Saturday, September 26, 2015, at the Magnolia Town Hall and Larson Acres Dairy Farm in Evansville from 10 a.m. to 4 p.m., corner of Highway 213 and County A. Free admission and free parking. The Field Day Venue is the Magnolia Town Hall and adjacent field lent to us by Larson Acres Dairy Farm. In the Town Hall, we will host a silent auction (check back here for photos of auction offerings), the Parkview FFA will be selling food and beverages and a number of crafts people including the Rock County Senior Volunteers will demonstrate arts such as spinning, knitting, and weaving. Horse-powered ice-cream making machine at various times. including ice cream and desserts for sale to benefit the Amish school. Larson Acres, a state of the art dairy operation, will also provide farm tours at 1 p.m. and 3 p.m. Space is limited to 50 people for each tour and sign up in advance is required at the Field Day venue. You will be directed from the Field Day Venue to Larson Acres farm. If you would like to participate or for more information, please contact Beth Anne Heyrman, wild1cat2@gmail.com, 920-488-2703 or Lauraine Smith, ljsmith45@gmail.com, (608) 576-2969.
ote: Please respect the participants and demonstrators and kindly ask permission before you photograph them. The newsletter is on summer vacation so there is no issue in July. The deadline for August is July 26th. Be sure to get the news and photos of your summer activities and growing foals to Mary Ellen Gray for inclusion in the August newsletter. The next club meeting will be in October. 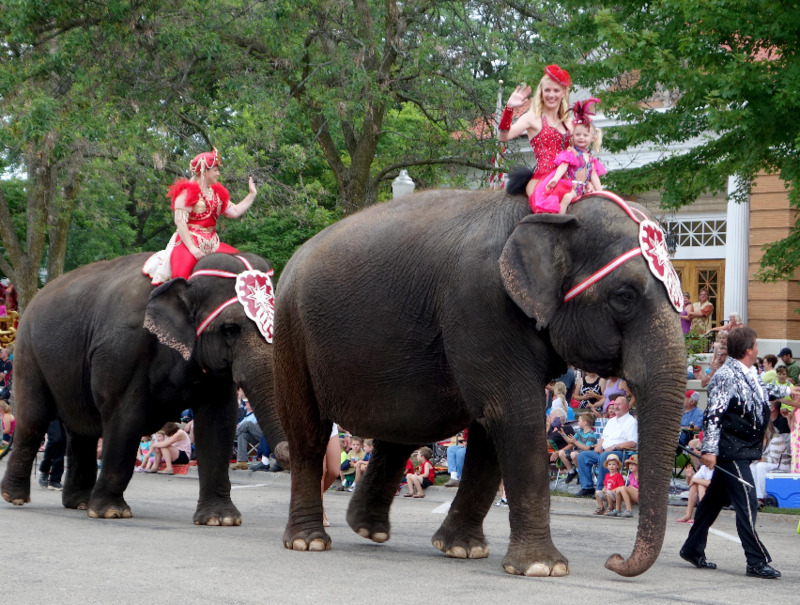 The Wisconsin Morgan Horse Club will again participate in the Big Top Circus Parade in Baraboo on Saturday, July 25, 2015. Bring your Morgan and be a part of this wonderful parade in historic downtown Baraboo. Contact Darcy Overturf, (608 986-3363, for information. Volunteers are needed throughout the day to help us set up the club booth, stall fronts, hospitality area, and carry equipment and propose for the demo practice sessions in Pavillion Two, stalls 3305-3313 and 3405-3413. Please contact Lauraine Smith , (608) 576-2969, and let her know when you will be available to help. Admission to the grounds is free on Thursday and the gates open at 8:00 a.m.
Demo participants: We have two time slots to practice the demo on Thursday, at 2:30 p.m. in the Coliseum, and at 6:30 p.m. in the New Barn/Pavillion 2. This means arriving earlier than in past years. Please check the Midwest Horse Fair page for complete details. The club demos are scheduled for Friday at 4:20 p.m. in The HW Brand Arena in Pavillion Two and Saturday at 10:10 a.m. in the Blain's Farm and Fleet Coliseum. March 26th is the deadline for submissions of farm news, photos, events, and classifieds for the club newsletter issue that will be printed and distributed at Horse Fair. March 26th is also the deadline for classsifieds to appear on the web page ahead of Horse Fair. Get your newsletter items and classifieds into Mary Ellen Gray by the 26th. March 26th is also the deadline for a four page, four-color advertising flyer for members (sample attached) to be printed and distributed at Horse Fair. Advertising blocks are approximately business card size and are $25 for one, $40 for 2. Please get your copy to Mary Ellen right away. She can help you with fonts, size, and other editing. The current classifieds will be printed and attached to the flyer. Non-members can place classified ads ($10 per ad) and purchase space in the flyer. Only current club members will be permitted to leave their own business cards, literature and flyers at the WMHC booth.